Services are scheduled for 10 a.m. Wednesday, Aug. 24, at Our Lady of Grace Catholic Church for Maria “Mary” Acosta of Artesia. 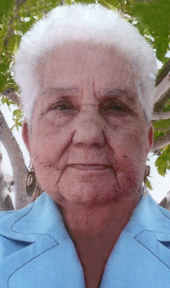 Acosta, 81, passed away Monday, Aug. 22, 2016, at Artesia General Hospital. Fr. Frances Lazer will officiate at the services, with interment to follow at Woodbine Cemetery. Pallbearers will be Scott Ramirez, Isaiah Mendoza, David Rosales, Albert Galindo, Fabian Gomez and Adrian Carrasco. Visitation will begin at 4 p.m. today at Our Lady of Grace. A rosary will be recited at 6:30 p.m. today at the church. Mary was born April 9, 1935, in Marfa, Texas, to Cipriano and Jesusita (Lujan) Dominguez. She moved to Artesia as a child and spent the rest of her life as an Artesia resident. On Sept. 8, 1952, she married Guillermo Acosta in Artesia. Mary was a homemaker and a member of Our Lady of Grace Catholic Church. She was active in the San Jose Society with the church and loved to spend time with her children and grandchildren. Survivors include daughters Mary Mendoza and husband Hector, Elva Mendoza and husband Ricardo, and Viola Hernandez, all of Artesia; sons Jim Acosta and partner Ed Gebhart of Albuquerque, Ben Acosta and wife Lois of Flower Mound, Texas, and Omar Acosta and Richard Acosta and wife Cindy, both of Artesia; 16 grandchildren; 20 great-grandchildren; and three great-great-grandchildren. She was preceded in death by her husband, Guillermo Acosta, in 1985; her parents; five siblings; and a son, Ruben Acosta.